Jamie Conway (Michael J. Fox) is an aspiring writer and yuppie living in New York City who seeks oblivion in cocaine and the glittery nightclub scene as his life falls apart (his wife leaves him, his mother dies, etc.). 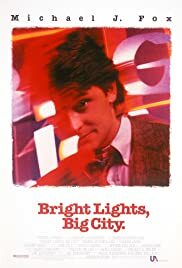 With his hard-partying friend Tad Allagash (Kiefer Sutherland) tagging along with him during their nights out, Jamie finds it increasingly difficult to show up every day at his unfulfilling job as a fast checker for a literary Manhattan magazine. Written by Larry B.
Michael J. Fox does an admirable job in the lead role of this movie adaptation of Jay McInerey's book. The plot concerns one man's downfall over the period of a week, and how it all stems from his mother dying and his wife leaving him. The movie follows the basic plot of the book with few changes. Overall a very decent movie, with a solid cast.